Hot button topics tend to make sensational talking points for theater. Chokehold by Anthony P. Pennino unabashedly goes right into the American race relations and police brutality for a sixty-minute high-octane drama that keeps you interrogative. Chokehold is a provocative topical piece about racial injustice and the reactionary frame of mind. A group of radicals eager to make a statement “arrest” a young white man in hopes of setting off a firestorm of change in America. 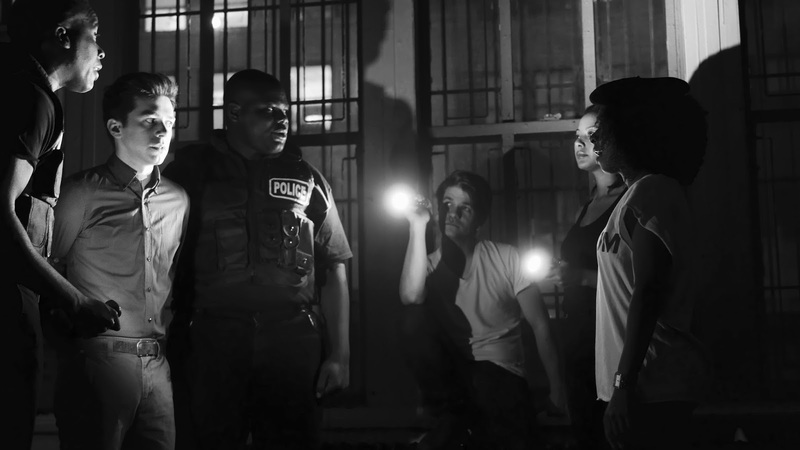 Reacting in part of the police brutality and rash of racial injustice continuing to plague the country, these five young activists plan on flipping the roles by filming two African-American “cops” kill a white man. What occurs is a journey of self-reflection and morality as the five and their subject discover just how these situations have altered their minds. Pennino’s script is unafraid of causing a reaction and getting the audience to emote. Pennino right out of the gate drops names and preaches to the audience. But it’s through his subtleties that Chokehold truly lands. Textually, when the five begin to interrogate timid Devon, their dialogue falls into the trap of regurgitated Facebook posts. But when things become personal and the stories and stances are character-driven, that’s when Pennino finds incredible beauty. The characters had depth and stories that were genuine and honest. Pennino allows right and wrong to play out in a fantastically dramatic fashion. The characters believe their actions, killing an innocent person, is justified and you sit in your seat thinking that the situation sounds eerily familiar. This isn’t an arrest. It’s kidnapping. And that’s when Pennino brings you the striking "Isis community college" line, things become authentic. Pennino knows what he’s doing crafting a play that allows you to think. He knows when to introduce humor and allow the audience to lightly laugh. He knows what evokes a certain reaction. But if there is a way to tone down the preachiness in exchange for story, Chokehold will be infinitely stronger. The material is heavy. It’s personal to some. And the ensemble did an astounding job bringing truth to the stage. As the “victim” Devon, Barry Sheppard gave an intricately multi-layered performance. While it may have been easy to go big, Sheppard played it cool. Sheppard brought fear and terror while still maintaining composure. It was raw, gaining incredible sympathy. Sheppard left it all on the stage, which was truly remarkable. As the masterminds behind the operation, Peter Collier and Kara Young as Carter and Dominique were explosive. An unlikely duo to be in control, Collier and Young took command. They were a dynamo. Mle Chester as Tika and Narada Campbell as Andre provided the most emotionally driven performances. Helped by their characters’ backstory, the breakdowns the two captured were stunning. As Jason, Neil Tyrone Pritchard was more than just the menacing force, finding heart within. The key to success was a strong vision by director Alberto Bonilla. As a production, Chokehold was handsdown a winner. For a festival play, Bonilla and co did everything perfectly. The house went out and a flashlight turned on. And another. And another. And then a camera light. And that was it. Bonilla told the story simply, evoking a strong sense of terror. As if the stakes could have been any higher. Bonilla used the space to his advantage, finding the right moments of movement and stillness. He allowed the beats to be hit and hit hard. There was a great sense of trust between Bonilla and his company as each individual was on the same page. Winning an audience from start to finish is not always an easy task. I don’t know the last time I sat in a theater and thought solely about the experience. The audience was silent in all the right ways. Chokehold on the surface is a play about race. But it's also a play about reacting in anger. And the final moment proves how anger hurts. Chokehold is destined for a life beyond Planet Connections. It’s a must see.